Spacious Residential Lot in Monte Cielo Subdivision Naga City. Perfect for large house or family compound. Vacant Lot in Guinobatan Palm Village, Bgy. Travesia, Guinobatan, Albay Price per sqm: 3,000/sqm. 3,011.31sqm Lot areas: 100sqm. 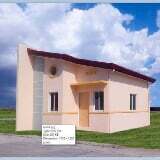 119sqm"
340 Sq.m House and lot for sale @ Masbate City European style, newly construct. With water and electiricty. Along the brgy road.